It is waterproof; this makes it ideal for watersports, unlike conventional bandages which quickly become soaked or tapes which loose their adherence. It is airtight - this keeps moisture in (ideal for burns or exposed bones / tissue) and infection out. It is inherently clean - I would not want to go as far as saying it is completely sterile but the manufacturing process (in combination with the above two points) means that once the first 'wrap' has been removed from the roll, it is as clean as anything you will find in a pre-hospital environment. It is transparent - being able to monitor infection or wound healing without having to repeatedly expose and redress a wound. It is malleable - being able to contort to complicated body shapes like knuckles or elbows where other dressings may struggle to completely seal, especially with continual movement. It is thin - some injuries may require cooling, other may benefit from warming. Being so thin, the cling film does not prevent a noticeable insulative barrier meaning the injury can be cooled or warmed with the cling film in place. A 12 inch roll is not a convenient size to carry. An attempt to cut the roll in half to a more manageable size usually results in the cut end melding together, making it difficult to unroll. The thin cardboard tube quickly degrades, especially when wet, making handling difficult. When it is cold it becomes very fragile with the potential to either unravel in strips or simply tear when being applied. 'Mini' Stretch Wrap is a much more convenient size to carry around in a rucksack lid pocket, stuff sack or buoyancy aid pocket. Stretch Wrap is slightly thicker - only by a few microns - which makes it easier to handle and slightly more robust against nicks and tears when on the roll. The cardboard roll is substantially thicker and slightly longer than the wrap; this protects the end of the roll. Stretch Wrap is stronger and, unsurprisingly, has more stretch. Because of this anyone intending to apply Stretch Wrap to a casualty must be acutely aware of applying it too tightly. Whilst caution is often taken during application, unintended tension is often applied when the First Aider attempts to tear the wrap from the casualty's limb when finished. Once sufficient Stretch wrap has been applied, neatly cut the wrap using scissors or shears. Before applying, check the Colour, Sensation and Movement in the casualties digits on the injured limb and compare with the uninjured limb. Then recheck CSM after the Stretch Wrap has been applied. Continue to monitor every 5 minutes for the first hour. Stretch Wrap and Cling Film are ideal coverings for burns; they create a clean environment and resist sticking to the burn and retain moisture preventing the wound from drying out, which in turn, reduces scarring. When using Stretch Wrap or Cling Film for burns, care should be taken to not wrap the injury tightly but to cover the injury in loose layers. Burns should be cooled with running water for a minimum of 10 minutes. 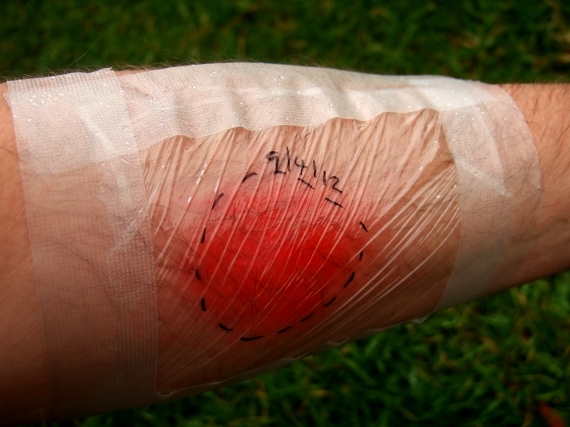 Thermal burns can be cooled with the cling film in place as it does not present a noticeable insualtive barrier and cooling can take place through the cling film. Caution should be used with chemical burns as some acids, alkalis and solvents may react and dissolve the film. The standard protocol for all chemical burns is to irrigate for 20 minutes; this not only cools but also dilutes and removes the chemical. Some chemicals are known to react with water ( lime in cement, hydrofluoric acid or CS gas, for example) which may exacerbate the burn temporarily but all chemicals will eventually be diluted if deluged with enough water. Film can then be applied.